On three different Dell Inspiron 1545 (and 1546) systems, grub hangs right after hand-off from PXE. I've tried 'localboot 0', 'localboot 0x80', and 'localboot -1'. -1 seems to work but only on the Inspiron 1546. 'localboot 5' was also attempted in case the issue was with how the PXE stack was getting unloaded, but it doesn't seem to change behavior at all. When the systems are booted directly to the hard drive (either using F12 to boot to the hard drive directly, or escaping out of PXE before it does boot off the network, grub loads normally and hands off to the kernel without a hitch. 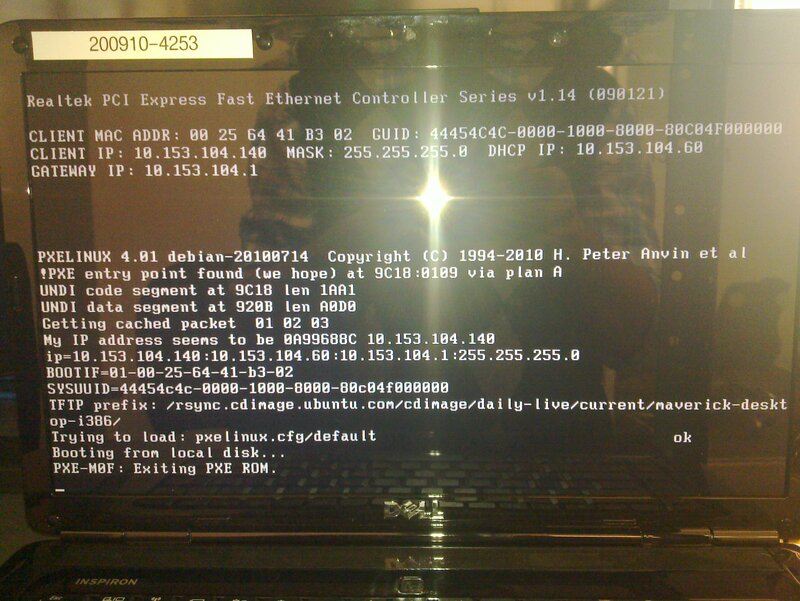 Installing grub with --debug-image=all yields no debugging information whatsoever if booting using PXE. Behavior is normal if booted straight to the hard drive (debug information is shown). Ok, apparently -1 works on the Inspiron 1545 as well, but this solution is not usable as it makes other machines (e.g. Toshiba systems) fail to boot in the same way described above. Are you able to provide any screen shot or log of the hang from a remote console? This system has grub debug image installed, yet nothing shows up. Please update the bug with any other suggestions to pull debug logs. Thanks. It seems unlikely to me that this is a GRUB bug. The evidence suggests that GRUB is simply not being loaded at all. In addition, the Syslinux 4.00 changelog says that -1 is also supported for PXELINUX. However, 0x80 is out of spec for PXELINUX. If the BIOS doesn't do what you want for any of these defined values, then it is not at all clear to me that there is anything that we can do about it. I don't know what to suggest. Spoke to Anouar and he agrees that it doesn't appear we can do anything about this. I'm going to mark this bug as a Won't Fix for now. Just to clarify things (though I agree there is sadly little than can be done anyway) I marked this bug as affecting grub because (if I recall correctly) using Shift would still sometimes yield the GRUB menu. We'll re-test this in the lab first though. Any update on your tests? Yes, it doesn't even get to accepting Shift, so it's as mentioned by Colin: this affects syslinux, not grub. Syslinux seems to of made a few undocumented changes in Maverick. Another example is bug #610017. Dave: that doesn't seem obviously relevant. We did catch up on quite a few upstream versions. We fixed this in the cert lab by using chain.c32 rather than LOCALBOOT. As far as I know, this problem was due to a PXE BIOS bug rather than a syslinux change, although it's possible that an otherwise innocuous syslinux change managed to tickle some previously undisturbed PXE BIOS bugs.